SPRIGHTLY tailor was employed by the great Macdonald, in his castle at Saddell, in order to make the laird a pair of trews, used in olden time. And trews being the vest and breeches united in one piece, and ornamented with fringes, were very comfortable, and suitable to be worn in walking or dancing. And Macdonald had said to the tailor, that if he would make the trews by night in the church, he would get a handsome reward. For it was thought that the old ruined church was haunted, and that fearsome things were to be seen there at night. night in the church, the tailor was not to be daunted, but took it in hand to gain the prize. So, when night came, away he went up the glen, about half a mile distance from the castle, till he came to the old church. Then he chose him a nice gravestone for a seat and he lighted his candle, and put on his thimble, and set to work at the trews plying his needle nimbly, and thinking about the hire that the laird would have to give him. For some time he got on pretty well, until he felt the floor all of a tremble under his feet; and looking about him, but keeping his fingers at work, he saw the appearance of a great human head rising up through the stone pavement of the church. And when the head had risen above the surface, there came from it a great, great voice. And the voice said: " Do you see this great head of mine?" "I see that, but I'll sew this!" said the sprightly tailor and he stitched away at his trews. shook a great pair of arms in the tailor's face, and said Do you see these great arms of mine?" "I see those, but I'll sew this! " answered the tailor; and he stitched hard at his trews, for he knew that he had no time to lose. 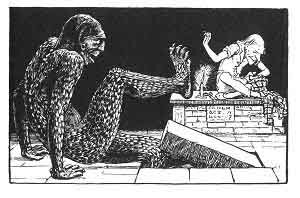 The sprightly tailor was taking the long stitches, when he saw it gradually rising and rising through the floor, until it lifted out a great leg, and stamping with it upon the pavement, said in a roaring voice "Do you see this great leg of mine?" his five great fingers. Ye may see them plainly to this day, if ye'll only peer close enough.